A very picturesque resort that has welcomed skiers since the turn of the century. Car-free, with life centred on the railway (which ultimately reaches Europe's highest station) and a spectacular back drop of the Eiger as well as the Mönch and Jungfrau. Site of the world-famous Lauberhorn race. The next notable snow forecast for Wengen is 22cm9in, expected on 26 April, with around 34cm13in forecast over the next 7 days. The Swiss Ski Resort of Wengen is part of the Jungfrau Region ski area with access to 591km367 miles of downhill skiing, with 131 marked pistes, served by a total of 66 ski lifts. In addition to the skiing in Wengen itself (112km70 miles of pisted ski runs), the appropriate ski Lift Pass will allow you to ski or snowboard in the other Jungfrau Region ski resorts of Grindelwald, Lauterbrunnen and Mürren. 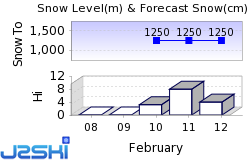 With ski lifts as high as 2,320m7,612ft, snow cover is generally reliable. A very picturesque resort that is set in some of the most spectacular scenery that exists anywhere in the world, Wengen has welcomed skiers since the turn of the century and is one of the handful of 'original' downhill skiing destinations pioneered by British tourists (it celebrated 110 years of winter sports in the area in 1998). The resort is the base of the famous Downhill Only Club (DHO), established in 1924 when the early English visitors first persuaded the locals to keep the railway running in the winter to get a lift up the mountains, then jump out and ski 'downhill only'. Many members of the Club still return every year, content to go back to the same resort annually, (often the same week in the same room in the same hotel). Wengen first appeared 'on the map' in the 1880s, before alpine skiing was invented, with the construction of the Wengenalpbahn, the first mountain railway in the area. This ultimately went on to reach the legendary Jungfraujoch, Europe's highest railway station, perched at 3454 metres (11,332 feet). Much of today's Wengen was then build on a sunny 'balcony' on the mountain along one main street ending, at the station. It is still reached by the antique but eternally efficient cog railway, which connects with the international European rail network. Car drivers must leave their vehicles in a carpark in the valley and take the train up. No introduction to Wengen is complete without mention of its other legendary and spectacular attraction - the Annual Lauberhorn World Cup downhill course, the longest and many believe the greatest there is. The longest possible descent in Wengen is 12km7 miles long and the most difficult run is the 'Lauberhorn'. Wengen's presence in the lists of 'most favourite resorts' for those who have visited it is an unusual one. Most other entrants will be there because of their fantastic skiing, Wengen will be there because of the how it makes you feel just being there, even before you put your skis or 'board on. The awe inspiring mountainscape above and below borders on a spiritual experience for many which makes even the most bland skiing experience seem marvelous. Not that Wengen's skiing is bland - far from it, nearly 100 miles (160km ) of trails, shared with neighbouring Grindelwald, are lift-linked from the village, with further 50km+ or so (31 miles) also on the Jungfrau top ski Lift pass across the valley at Mürren. The main ski area shared with Grindelwald is the Kleine Scheidegg. It is reached by the cog railway from Wengen to Wengeneralp in about 25 minutes (this may also be busy with non-skiing tourists on their way up to the Jungfraujoch, especially later in the season). The second main area is Männlichen, reached by cable-car from the village or accessed from Kleine Scheidegg. Beginners will find nursery slopes in Wengen proper with friendly and efficient English-speaking schools and another area up at Wengeneralp . Intermediates will be most impressed by all that the Jungfrau top ski area has to offer, with many long, wide open runs above the tree line. Highlights include a trip over to Grindelwald for the 8km (5 mile) run down from the Oberjoch to that resort on its separate First ski area. Grindelwald itself can be reached by another popular 8km (5 mile) run down from Männlichen. Experts will not want to miss the opportunity of a descent of the Lauberhorn, even if they can't match Franz Klammer's pace. This is now reached by a new chairlift from Scheidegg, above which the tough trails include the succinctly named Oh God! off-piste descent. Many skiers and 'boarders tend to end the day with the 7km (4 mile) run down from the top of the Lauberhorn back to Wengen, perhaps calling at Mary's for a pre-après ski drink en route. A day trip over to Mürren on the train should not be missed in order to try another legendary run, the 6km ( 4 mile) black down to the resort from the famous Schilthorn revolving restaurant. Wengen is highly rated by Snowboarders and there is a Snow Park in Wengen. We don't currently have confirmed season dates for Wengen. Usual opening is late November, and usual closing is Mid April . NOTE:- Lift and Piste openings are always subject to Snow Conditions in Wengen. Wengen is able to make snow, on 50km31 miles of ski runs, with 150 snow cannons. The 19 ski lifts of Wengen are able to uplift 20,200 skiers and snowboarders every hour. Wengen is in the Swiss Alps in Jungfrau Region, Interlaken, Switzerland. The nearest airports to Wengen are Berne, Zurich and Basel. There are nine airports within three hours drive. The Webcams in Wengen are not always up-to-date. Please check the date on the image to ensure you are seeing current snow conditions. Although probably not the choice for those who put their partying before their skiing, Wengen nonetheless has enough lively bars and nightspots for most tastes. Unusually it is the locals, and often visiting Germans, who add to the fun. The British clientele are generally not at the forefront of the nighttime action as they are in many other resorts where they are the dominant seasonal incomers. After the lifts close the pavement cafes that spill out around the station are generally crowded, happy places and tea dances begin at the nearby Silberhorn and Belvedere. Lively bars through the evening include the Tanne and the Pickle. Sina has live music and karaoke nights. Apart from partying options include the cinema, often showing English language films and occasional floodlit slalom races and ski jumping to watch, as well as ice hockey matches. Later on there are a number of discothèques. Other Ski Areas within Jungfrau Region. 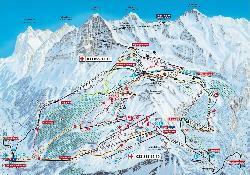 Other popular Ski Areas near Wengen. Want to ask about skiing and snowboarding in Wengen? Or contact Wengen Tourist Office. Note :- The information on J2Ski concerning Wengen, where not clearly factual, is opinion only and is neither definitive or exhaustive.